– The Self-Signed certificate, generated by Exchange 2007 installation has expired and you are getting Event ID: 12014 and 12015 in the Event log, plus the complaints of Outlook 2007 users about the security alert “The security certificate has expired or is not yet valid”. – You want to enable and configure Outlook Anywhere, without purchasing a commercial multiple domain certificate. – You want to get rid of the annoying security pop-up warning which OWA (Outlook Web Access) users are getting. – Install and configure Windows CA (Certificate Authority), and request a multiple domain SSL certificate from it – we will demonstrate this scenario, in details in a separate Screencast. – Purchase and install a commercial SSL certificate – this is already covered in details in our Exchange 2007 Screencast series. 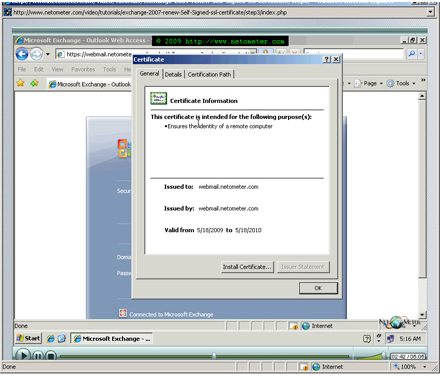 In the followingÂ Step-by-Step video tutorial, we demonstrate how to generate a new Self-Signed certificate in Exchange Server 2007 which includes all the necessary names in it. You can also see how to enable the SSL certificate for the Exchange services and remove the old one. For your convenience, we provide the text file with the shell commands, used in the tutorial here. My SBS 2008 has the described Problem and I want to renew the one year old Certificate for the Exchange 2007. One the Server is a Godaddy Standard SSL Certificate installed. Can I run the Renewal as described in the Screencast? Yes, you can renew the certificate that way.